David Silva leads the way in the Real Assists League, with Pedro and Sadio Mane among the other players to have more than one open-play assist. Statistics in football can be useful…but they can also be extremely misleading. There is no better example of that than the assists, which are arbitrarily awarded by the Premier League every weekend for the simplest of passes – think Jon Walters claiming one for Charlie Adam’s wonder goal at Chelsea last season. – Alex Oxlade-Chamberlain got the official assist after his shot was deflected in by Fabricio Coloccini, but we’re instead rewarding him with a ‘key role in goal’ mark. – Danny Graham getting an assist for winning the free-kick from which Yann M’Vila scored is a fine example of how this particular statistic can be flawed. – Scott Sinclair won and then scored a penalty to equalise for Villa. – Jordan Amavi then set up Sinclair to make it 2-1 with a fine low cross. – Substitute Ola Toivonen assisted Jeremain Lens for Sunderland’s equaliser with a slide-rule pass after winning the ball in midfield. – We’re taking an assist off Max Gradel for Bournemouth’s opener – it was a fine solo goal from Callum Wilson. – Jamie Vardy won the penalty from which he scored Leicester’s equaliser. – Yannick Bolasie gets a ‘key role in goal’ mark for sending in the cross from which Bakary Sako scored Palace’s opener after Cesar Azpilicueta’s failed attempt to cut out. – Pedro got another assist with the cross from which Radamel Falcao headed in Chelsea’s equaliser. – Sako then claimed the assist with the clever cut back for Joel Ward to head Palace to victory. – Aaron Cresswell set up West Ham’s opener for Manuel Lanzini with a low cross inside three minutes. – Lanzini himself gets a ‘key role in goal’ mark for the Hammers’ second after robbing Dejan Lovren before sending in a low cross which resulted in Mark Noble’s goal. – Diafra Sakho’s third goal in stoppage time was a solo goal. No assist. – Bacary Sagna set up City’s first for Raheem Sterling with a cross from the right. 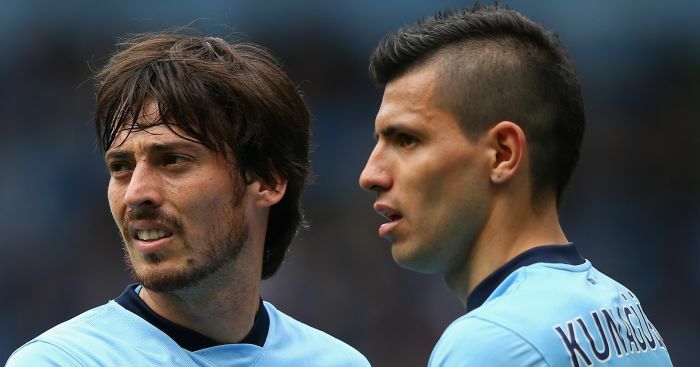 – David Silva laid on their second for Fernandinho with a clever pass inside the area. – Rickie Lambert assisted Soloman Rondon’s goal with a pinpoint cross from deep. – He was offside, but Graziano Pelle’s opener for Norwich was set up by a clever Sadio Mane pass. – Mane set up Saints’ second for Dusan Tadic with a run and cutback from the right. – Pelle got the official assist for Tadic’s second after his header was saved, but we don’t recognise players attempting to score. – Luke Shaw set up Juan Mata’s goal for United with a cross from the left. – Gylfi Sigurdsson assisted Andre Ayew’s goal with a cross from the right. – Ayew then set up Swansea’s winner with a brilliant pass for Bafetimbi Gomis. Manchester City’s David Silva now leads the way with two-open play assists, a set-piece assist and a ‘key role in goal’ mark, with Chelsea’s Pedro and Southampton’s Sadio Mane joining Leicester’s Marc Albrighton, Bournemouth’s Max Gradel, Crystal Palace’s James McCarthur, Everton’s Arouna Kone and Norwich’s Wes Hoolahan on two assists from open play so far this season.